Pairing Try it with a fresh salad. It would also pair well with big cheeses - like an aged cheddar or gouda, carrot cake, salmon, and more! We first brewed Cashmere Track Suit as a on-off beer for our Hoppin’ Summer Series II. It was so popular that we’ve decided to brew it on a semi-regular basis now! 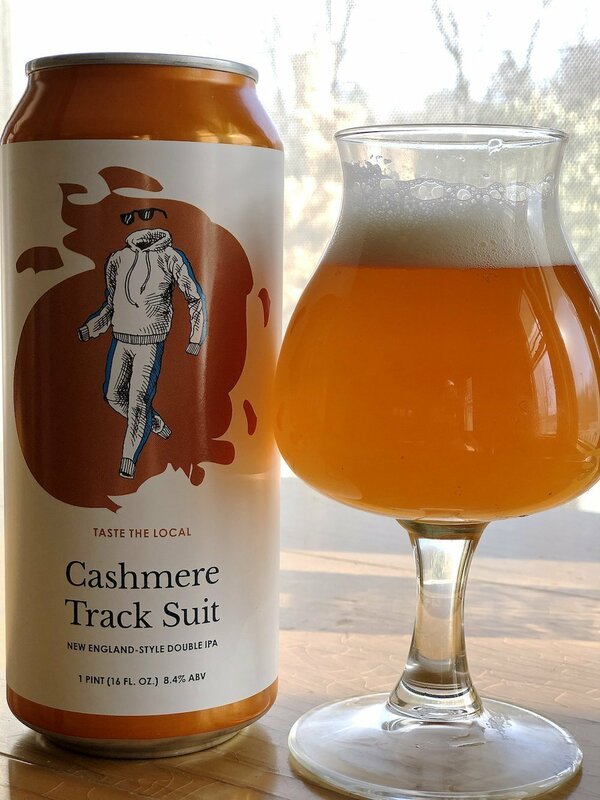 Cashmere Track Suit is a New England-Style double IPA packed with flavors of citrus and melon, with a slight hint of pineapple. This beer drinks so soft with a subtle fruity sweetness that you might not guess it is 8.4% ABV! – Appearance: Sun-gold in color with a beautifully thick off-white head. This beer has a fair amount of hop haze. – Aroma: Pineapple, citrus, melon. – Taste & Mouthfeel: I wish juicy wasn’t such an overused term.. otherwise I’d say that describes this beer exactly! Take a sip and you will get lots of citrus and fruit flavors, including melon and pineapple, with a very light strawberry sweetness (from the Belma hops). Even though this beer is very aggressively hopped (with Mosaic and Cashmere), it actually drinks very soft and balanced. The body is fairly robust – I would say a medium to medium-heavy, creamy mouthfeel. – Pairing: I’d love to drink this on a hot summer day with a nice, fresh salad. It would also pair well with big cheeses – like an aged cheddar or gouda, carrot cake, salmon, and more! – Serving glass: At the brewery we will be serving this beer in a 12-oz tulip glass. – Stats – ABV is 8.4% and IBU is 92.